As the colder months come near, many people look forward to getting their gear ready for ice fishing, a favorite past time for those who live in colder parts of the country. You can choose lines and hooks or you might be a fan of spearing – but no fishing gear will protect you from the sharp and frosty weather. In order to prepare for this chilling event, the proper attire needs to be worn, the kind that will keep you warm and lots more. Below are ten ice fishing jackets and bibs sold online to help get you through the frigid temperatures. There are some major differences between jackets and bibs used during ice angling. Before the reviews start, take a moment to see what features set them apart or shows similarities. Here are five of the best jackets for you to consider choosing in preparation for a future ice fishing trip. They were picked on a number of reasons, mostly for value versus expense, safety features, and material quality. If you aren’t sure where to start, jump to the buyer’s guide section to prioritize on the parameters of your desirable apparel. 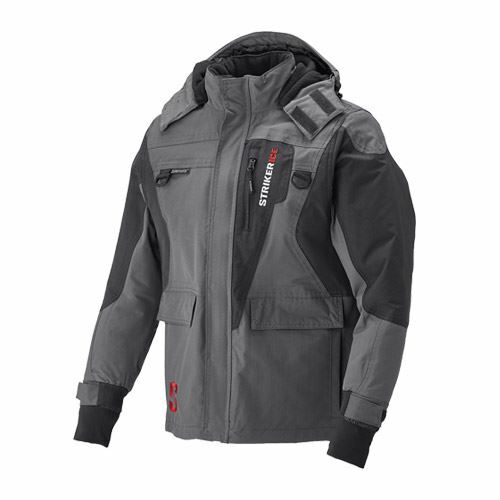 The Stormr Strykr jacket is sold in three distinct colors: black, red, and grey. It’s made completely of polyester but lined with fleece on the inside. The material also forms the collar. The outer portion blocks out freezing gusts, even when the wind chill is well below freezing. In cold regions, the ability of your attire to stay dry is crucial due to the wicking effect of moisture captured in the fabric. This effect drastically increases the rate of heat loss, which is how the humid weather amplifies the chill. This jacket was made for both humid and dry settings, so bring it with you to see how well it holds in dry, warm air underneath the fleece. The cuffs are especially well made and stay dry, even when you’re working in the snow picking ice or clearing runoff from holes. Overall, the Stormr Strykr leads with the highest recommendation from its ability to retain heat better than any jacket you’ve probably had before. So long as you’re dressed properly (as shown in the buyer’s section), you’re torso and neck will stay at room temperature throughout the entire ice fishing event. You may even be tempted to do it as a normal jacket when you’re not on the ice! Although the jacket will keep out water, it’s not entirely waterproof. Black patches, mostly along the lower portion that’s closest to tail, may seep in some liquid if it comes in contact with water. This won’t occur from just normal wear though, so don’t worry if the weather suddenly gets worse. Sleet and snow will stay off, but if any don’t appear to absorb into the area mentioned, just brush it off and you should be okay. May need to be opened to keep moisture from developing in the jacket’s interior. The Striker Ice Predator is a little bigger, but that’s a quality that you’ll come to love. It’s thick, insulated, and produces ventilation in the upper body well. Instead of getting hot and sweaty, the Tussor Shell airs out with a Thermadex and Hydrapore system. In plain English, this means the jacket contains three layers of fabric, each tasked with keeping wind and water on the outside. But that’s not all. It’s porous enough pass some air through, resulting in a dry comfort that doesn’t cause body odor. 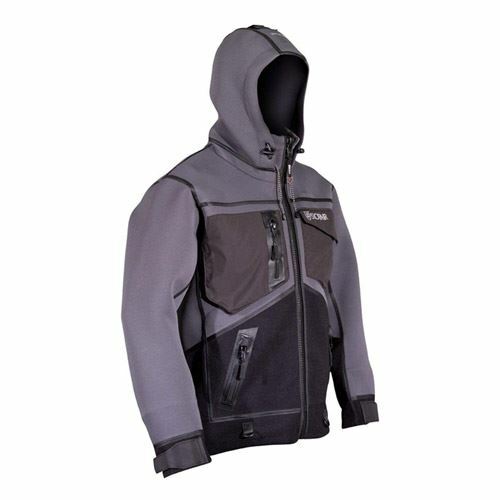 When you’re done fishing, you and the jacket will feel as if you never stepped on the ice, to begin with. 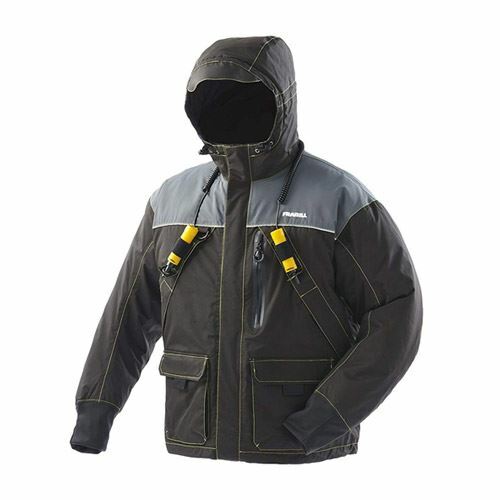 Recommended for fishers that need a jacket that’s slightly bulky but doesn’t impede movement (or become stiff). Its hood is far from perfect because of the obstructed peripheral vision. Even though you can easily adjust the hood wire, this slightly annoying issue persists. As the jacket’s top part also lacks adjustable side straps, you have no other option but get used to this reduced side view. Prevents water from entering during moderate to heavy rainfall. Size may run a little smaller than what is specified. Everyone knows that safety is of utmost importance when ice fishing. Knowing what to do in an emergency will keep everyone okay and free from potential injuries. But the best remedy of all is prevention. 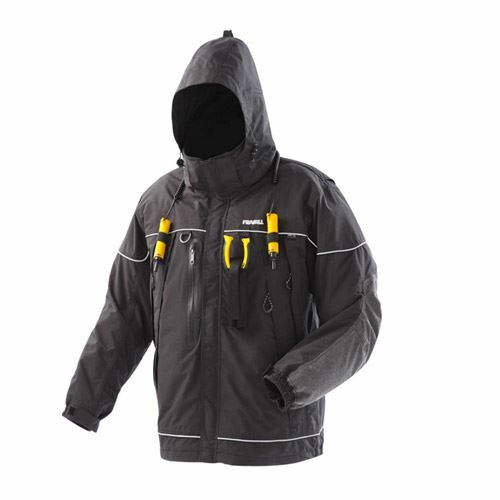 Safety wise, the Frabill I-Float Jacket has enough crammed underneath and outside the clothing, that some other accessories from your list of must-bring items could be left at home. There’s a USCG-certified floatation device incorporated into its body, along with ice picks and reflective tape. It’s a bit noisy, so if you’re irritated by the sounds that a jacket will make when the elbows rub together, try a different product. If not, ease your safety concerns with the I-Float. There are drainage patches located throughout the jacket to minimize the amount of water that enters. No inner pockets featured on the jacket. Some jackets look so good, you may buy them for the appearance alone. The Frabill Ice I5 is one of those but has a couple other perks that give it a spot on the list. First, there’s the sizing. It’s sometimes hard to choose apparel online, mostly due to sizing inaccuracies. This one gets it right the first time, so as long as you know the correct size you need already, the jacket you pick won’t feel too large or small. The elbows are reinforced with small padding to help increase inside temperatures close to your arms. Just watch yourself in those below-zero temps; the nylon material may stiffen when the air gets too cold. However, it won’t happen when it’s a little humid (during snow falls) so try out the I5 if you’re a want a PFD that looks nice and is wrapped in one jacket. Fabric becomes stiff when worn in frigid temperatures. The I3 is very similar to the I5 reviewed above. The main difference between them if the thickness. This one is lighter in weight but still retains a floatation device and ice picks. You don’t need a period for it to form to your body either. There are warming pockets located near the tail as well, so try it out if you tend to take off your gloves in between fishing. The jacket has several pleasant surprises, which start from its being very warm despite the featherweight design. Its fleece-lined hand-warming pockets only add to the feeling of enveloping warmness when you’re wearing it. The attire sits very well, comfortably allowing freedom of movement. It is a little short though, but if you’re smaller than average this shouldn’t be an issue. And keep an eye on your ice picks. They might come out if you’re not careful. Still, the I3 scores high marks for maintaining a good interior temperature that’s not irritating. The ice picks frequently come out of the holters. The Stormr Strykr bib is a counterpart to the jacket, so it’s what you would want if settling on the first pick that was reviewed already. There are deep pockets on the front that can hold lots of things but won’t become damaged from water; it’s completely waterproof. But if you’re not getting a jacket from the same brand, it’s designed in a way that feels wonderful underneath one that has a PFD device. Simply put, you won’t feel as if you’re carrying too much junk around the torso. The adjustable straps are key to this, being thin enough to the point where you’ll forget they were there. Advised for people that are getting the same brand for a top or anyone who has a heavy jacket already. In case of this bib, you can actually overdo with warmness. It might feel great in the early morning but as the day warms up you’ll find yourself being cooked alive. It’s definitely not something you’d like to wear in temperatures higher than 55-60 degrees. This also explains why the attire weighs so much (a bit more than 3 lbs). Difficult to size, must be measured according to an individual’s body and preference. The Striker Ice Predator is next, being made from the same fabric as the jacket. There are magnetic openings along the pockets, entirely waterproof, that are ideal for storing sensitive objects such as smartphones and/or personal items. If concerned with sizing, this one leads by having straps that are built to conform to a number of heights. Whether or short or tall is of no concern, most sizes will fit so long as you’re close to getting one that’s within your measurements range. 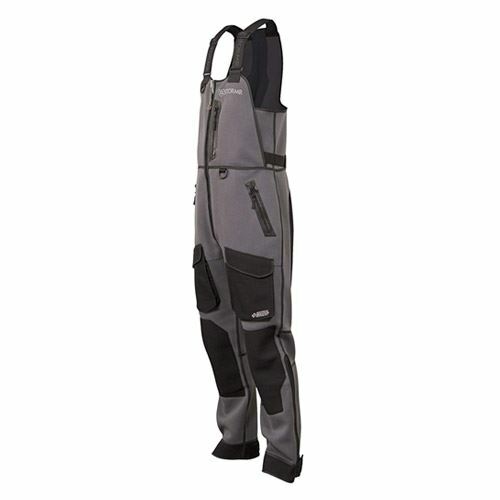 The knee and rear padding is also built well and causes no pain when kneeling down to pick up your catch. Use it if you like to make a large number of holes and are planning on spending a good amount of time with your legs on the ice surface. You’d better not put them in contact with ice and/or snow for too long because this bib is positively NOT waterproof. It might come across as actually waterproof on the beginning but in the long run, it’s not. Staying on your knees/sitting in the snow is not recommendable. However, as puffy and bulky as it is this bib might really help you float in the first seconds if you break under. Padding on the knees and rear. Shoulder straps may lose their adjustments and slide when worn. The Frabill Mens I-Bib is the turtle shell of bibs, having a thick layer of nylon that seems to bounce off any ice and water that comes in the way. It’s odd how the straps on top contradict to the rest of the clothing’s body; the material is dense and almost intimidating but very light toward the upper area that suspends over the shoulders. The buoyancy is stellar here, almost being a floatation device on its own. Paired with the jacket that has the same attributes, the body will be entirely enveloped and almost gives the feeling of having on a HAZMAT suit. Use it if you’re fishing in weather that fluctuates from clear the heavy snow. You’ll be happy that you did. In water, makes it easier to pull body upwards during the event of an emergency. Shoulder straps are long and require lots of adjusting to get them at the intended size. The I-Series winter apparel by Frabill has a lot going for it performance-wise. Frabill famously uses the most advanced materials available and cares a lot about how their attire fits the end user. This bib features a 300-denier nylon oxford shell that doesn’t let in water while having good breathability. 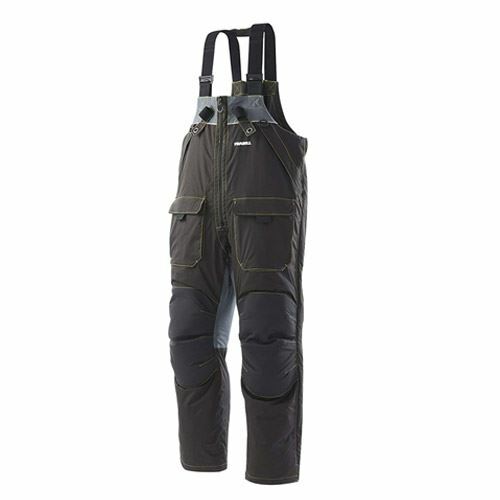 Its knees and pant cuffs are nylon-reinforced with 500-denier fabric. 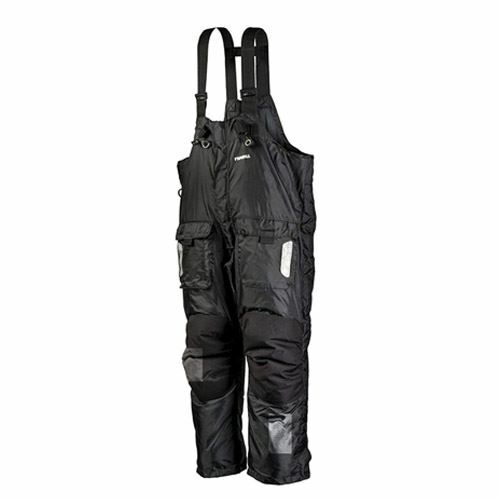 These bibs are as tough with their 100% seam-sealed design as they are ergonomic, which means the angler will be able to enjoy the comfort of this attire for years to come. The I5 bib by Frabill focuses on airing out the user when worn during fishing. And just like it’s matching the top, there are multiple layers of protection included here. But what’s nice is the counterweight that seems to balance things out by having good padding in the center, which will keep you from feeling like you’re lifting weights with your legs every time you take a step. Just make sure that you go to the bathroom before you put it on. You will have taken off your jacket and straps when you do. And extensions aren’t available around the bottom liner which makes it a little harder to form around the boots. Straining becomes annoying when you’re frantically trying to get things pulled off in such as event but if you can manage, the I5 remains a solid bib for any ice fisher. Has a good balance of counterweight at the bottom without feeling overwhelmed. There are no extensions around the liner, making cold air move upwards around the legs. This Frabill bib model comes complementing the jacket of the same series. Most of the bib’s fabric comprises a 300D nylon Taslan known for its being highly durable, water- and windproof, as well as breathable. 500D nylon reinforced inserts are located on the pant cuffs and knees. The attire stays evenly warm thanks to 3M Thinsulate insulation and features padded sections on the knee and rear area for extra comfort. Last is the Frabill I3 bib, a nice set to end the list with that’s relaxing to wear and attractive in its own right. The dark colors look bold, strong, and are woven with thick nylon on the exterior, especially around the knee. There are only two sizes available but some people who are a little smaller might get away with a larger piece (just measure). One nice feature is its inability to stiffen when the temperatures drop. Use it to help you stay dry and but not scorching hot inside, particularly if you sweat a lot. Sizes will fit most body types. Wide fit might be awkward for lean individuals. Normal jackets will usually have fabric on the exterior that keeps water from penetrating through the material. However, those reviewed (and any that are the similar) will feature additional measures to help keep out water in the event that a user becomes submerged. These can include small portholes that are zippered, making it harder for liquid to pass through. Others are simply more layers of polyvinyl chloride (PVC) or polyurethane that are embedded in between the the fabric. Cuffs may also be form fitting and built in such as way that enables water to stay in and out. As you come across different jackets for ice fishing, you’ll notice that many brands market their clothing with features that include brand names. This usually describes a combination of materials that are used for insulation. As stated, PU is oftentimes the most popular choice for keeping the body warm. PU stands for (thermoplastic) polyurethane coating that is also used in diving suits. This kind of material is highly rated for its lightness, breathability, and durability, leave alone waterproofness. PU often comes in-mixed with polyester. At the same time, fleece and neoprene are also heavily utilized. The latter is a synthetic rubber that’s often stitched around the cuffs and neck. Ice fishing jackets may have them on the collar in the chest as well. Simply put, ice fishing apparel is be almost useless if it hinders your ability to work on the ice as normal. If you’ve never worn one, keep in mind that they are slightly heavier than most normal jackets. This is due to the thick fabrics woven into the inside. Others may include PFD material and ice picks that also add excessive weight. If you feel that such additions will become bulky after wearing a jacket that has them for a couple of hours, stick to the lighter varieties. Clothing that’s worn during ice fishing obviously needs to be built to withstand ice, water, and snow. While the weather may contribute to the wear and tear of your attire (such as by corroding its zippers), the most crucial challenge for clothes durability is the frequency of use. 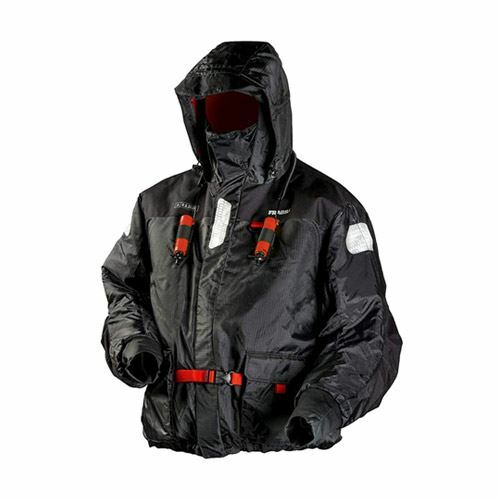 High wind and snow protection will not always mean toughness at the seals. It’s true, multi-layered fabrics with patches of fleece, for example, tend to live longer; however, you should care to check whether they are double-stitched or weld sealed in the first place. Another thing affecting the long-lasting performance of your bib/jacket is abrasion resistance. Normally, the knee and seat area of your costume will come reinforced and made of tougher materials. Furthermore, seam sealed clothes grant you the ability to counteract the colder air outside with your body’s natural heat, thus decreasing the heat exchange. What good is a jacket if you can’t make quick adjustments as needed? Most types will include a hood whose size can be altered, and with some, you will be able to unbutton and/or unzip the hood completely. Even more easy adjustments are added with the bib’s waist straps. You can tighten these to get the attire fit more snugly and vice versa. Most won’t let you change the height of the tail but could possess straps or string there to tighten the lower portion. When doing so, the tail will conform to the user’s waist size as it stops at the bib. Another thing that jackets may offer is storm cuff. Made of neoprene or similar waterproof fabric, this type of cuffs locks out the rain/wet snow with a velcroed adjustable strap. As noted, some of these jackets include safety features that incorporate floatation devices and small ice picks. When it comes to PFDs, they may possess some sort of certification, most notably from the US Coast Guard. Those that don’t shouldn’t be entirely ruled out, however. Some companies simply have not had their product certified. If you already have a PFD to wear around your waist, this could be avoided for jackets that don’t feature such. Yet those without should definitely consider them as an important safety tool to keep around if the ice breaks. With a quality bib&jacket set, you get yourself a bunch of self-rescue means including ice safety internal label, ice picks in holsters, and drainage mesh. You may purchase your attire with ice picks already attached or find them as a separate item wherever else. The idea behind these spiky lifesavers is that you should actually wear them, rather than just tuck away in a pocket rendering the picks inaccessible in the time of need. As a rule, the handheld, retractable spikes are worn connected to about 70 inches of stretchable cord. It slides through your parka/jacket’s arms, across the back, and then out the cuff. Being kept in holders on the chest, the picks stay within your easy reach with their spikes safely sheathed. The spikes will only activate when you grab the picks and press them to a solid surface, such as ice. PFDs are a smart way to prevent drowning and cold shock. In case of snow and fishing suits, U.S. Coast Guard maintains a set of strict requirements according to which an attire you buy may be considered a float suit. The minimal level of flotation characteristics include 1) flotation itself resulting from waterproof materials, 2) foam padded sections in the knee/shin area. In cold water, your self-rescue capabilities depend not as much on your buoyancy as on the ability to escape the ice pool ASAP. As you kick your feet in the water, the knee paddings help your body to assume a horizontal position, so that you can pull yourself onto the ice. The next thing you’ll be doing is rolling away from the ice hole toward a more stable ground. Your attire’s buoyancy is directly derived from its featherweight and water-resistant (e.g. neoprene) construction. Cheaper sets of fishing clothes, even though lacking approval by U.S.C.G. as a PFD, still guarantee you pounds and pounds of positive buoyancy. 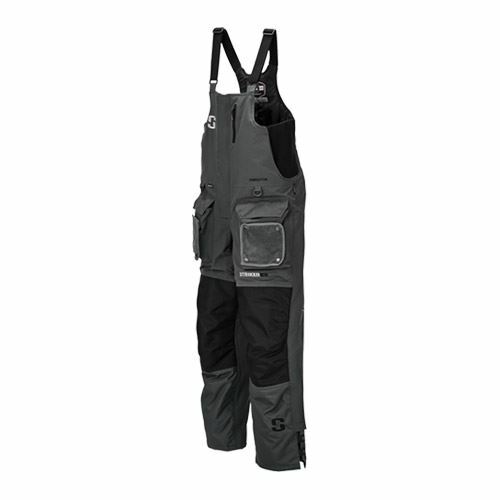 What Makes Good Ice Fishing Clothing? The jacket is only half of the gear you’ll need to wear for ice fishing. An ideal setup would be bibs that have sealable seams at the bottom and good padding in front of the knees, zippers on them that has zippers located in the right places (in case you need to go to the bathroom), and the jacket itself. Those with safety accessories are also a plus. When put on, a proper wardrobe will keep your body insulated to the point where it feels as if you’ve never stepped outside in the first place! 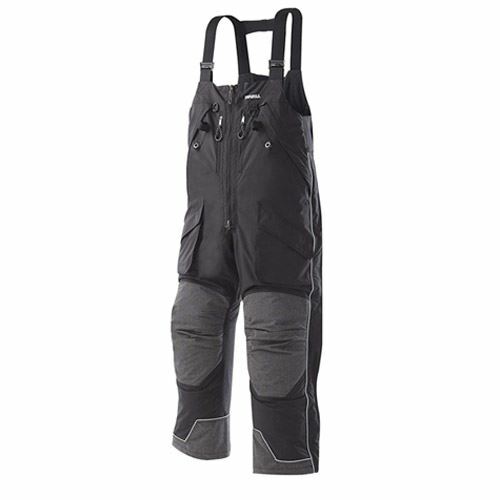 How to Dress with the Proper Ice Angling Apparel? Since you’re going to be out in the cold weather for hours at a time, you’ll want to use the tried-and-true methods of dressing in layers. This means that you should have some sort of attire on underneath your jacket and bib. The bib’s straps should go underneath the jacket and be adjusted so that the slacks don’t hang too low at the bottom. You won’t want to take anything off to make readjustments, so know what length is comfortable for you when tightening shoulder straps. And don’t forget about the seams on your cuffs. They should make contact with your gloves or mittens without leaving wrists exposed. In the end, the most durable and insulated jacket combination on the list goes to the top two. This also includes their respective bibs on numbers six and seven. What sets the Stormr Strykr and Ice Predator brands apart from the rest is having no faulty inseams, good breathability, and windproof/water resistant fabric. This isn’t to say that the others reviewed shouldn’t be ignored. There enough additional attributes to warrant a purchase of any on the list, according to your individual needs. Regardless of what you end up with, your best ice fishing suits will remain warm and toasty until the event is finished!